medi makes the treatment of lymphoedema even more individual than ever before. Please note that the concept presented here is perceived to be an ideal umbrella concept. Products may not be available in all countries. 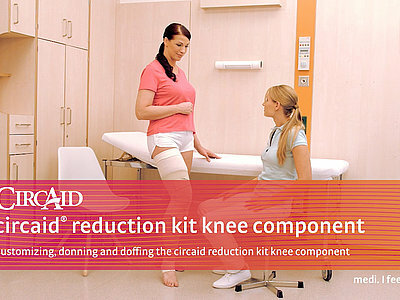 Adjustable compression device – for individual, effective and fast reduction. Intensive therapy phase for reducing arm or leg circumferences. Following intensive therapy a period of transition management before progressing to long-term therapy. 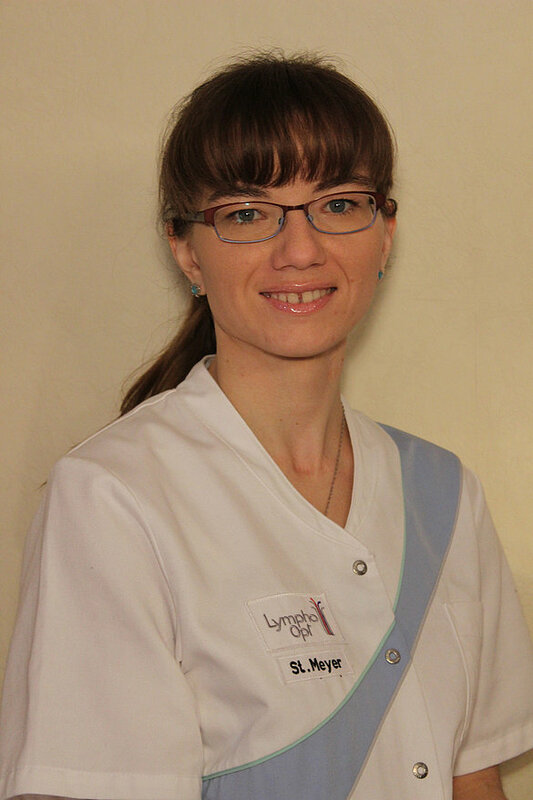 Long-term management of lymphoedema maintaining best therapy results. The circaid reduction kit supports unique applications with arm, lower leg, upper leg and knee components to meet the patient’s specific needs. 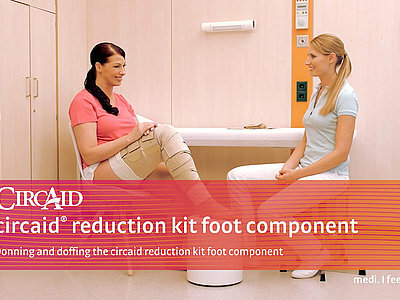 The components can be mixed with unique foot pieces and hand pieces to create a solution that drives decongestion and enables patient participation from the first day. The patient is empowered to continue the therapy at home which improves overall outcomes. Patients can independently don and doff the reduction kit components, instilling a level of indepencence not possible with bandages. The adjustable circaid reduction kit products encourage patient empowerment. 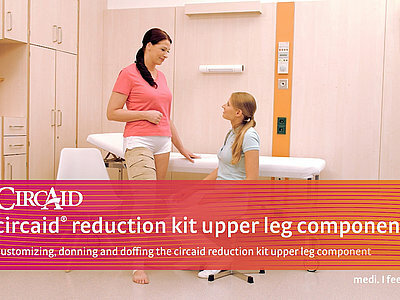 The patient will willingly and purposefully adjust the system to maintain compression levels as lymphoedema reduces. This establishes a new level of freedom for the clinician and the patient as they are not limited to clinical visits to reapply traditional bandages facilitating steady progress during decongestion. Following intensive therapy, some patients may benefit from a transition phase, where results achieved during the decongestion phase can be optimized before moving on to the maintenance phase. - ciraid juxtafit products are able to cover those needs. Again, the patient can independently don and doff the circaid juxtafit device immediately, instilling a level of indepencence. 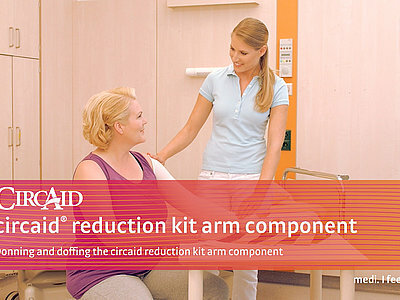 The adjustable circaid juxtafit products encourage patient empowerment. 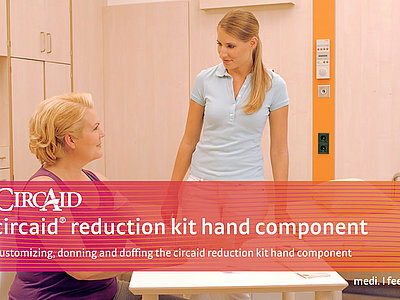 medi has expanded its range of products and offers individual solutions for the patient’s needs. 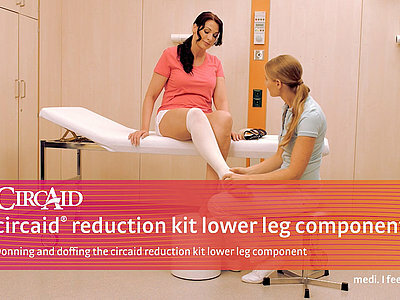 With circaid juxtafit as an alternative to compression stockings, patients can easily apply and remove this adjustable, adjustable device themselves. Furthermore, circaid graduate, the custom-made and padded device to be worn at night, maintains the outcome of decongestion even while the patients sleep. 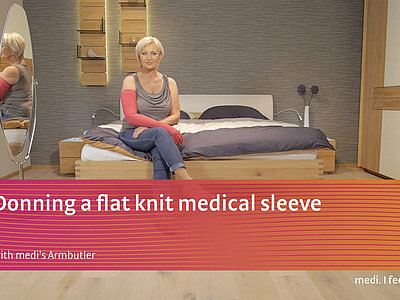 So patients with lymphoedema can be cared for around the clock with medi products. medi’s lymph therapy concept offers the necessary flexibility and variety of products for this. medi’s lymph therapy concept, the new approach in the treatment of lymphoedema - maintain the treatment success in the long term. "It is a positive advantage to get all devices from one manufacturer. With the range of products available, the decongestion phase (phase I of the therapy) particularly in lymphoedema stage 1 and 2 can be carried out in outpatient care. In the maintenance phase the patient can become self - managing with a little guidance and really help themselves achieve great results. This way as attending physician I am able to achieve better results and can control the costs. The supervision is guideline-compliant and the patient is cared for very well. Patients experience a feeling of well -being during treatment and effective oedema reduction in phase 1 can be achieved quickly, therefore the result is maintained effectively." "The circaid reducion kit can be individually adjusted for every patient. It is easy to use and the pressure range can be set by adjusting it at any time in order to improve the efficacy." "medi supplies patients with lymphoedema with all their products from a single source, for the decongestion, the transition and for the subsequent maintenance phase. This simplifies and accelerates the entire patient management process. Our therapy concept lymphology offers indication-adapted care that encourages patient self-management and thus contributes to long-term success in the treatment of lymphoedema. 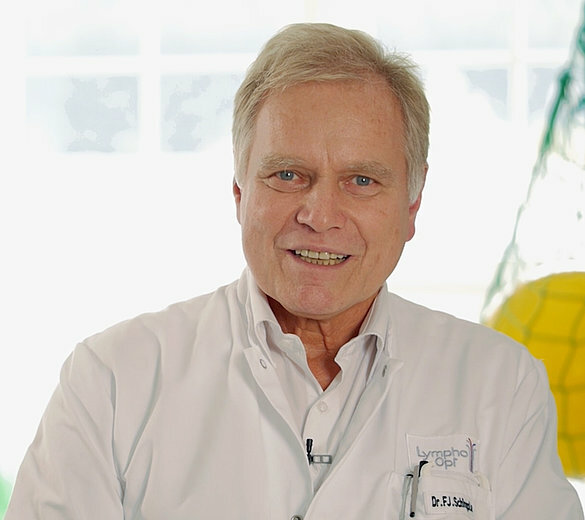 Our aim is to establish this concept in Germany and in other countries as soon as possible as well, in order to give people with lymphoedema as much freedom as possible in their day to day lives." 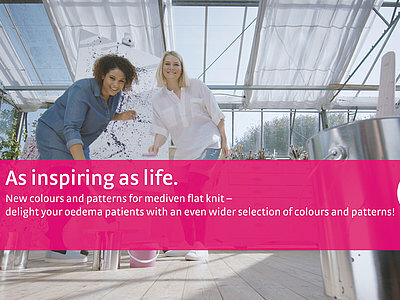 mediven flat knit trend colours – As inspiring as life. Accessories – All components are a perfect fit! Pleasant care for the skin. Makes the stocking slide over the leg even more easily. Small, but highly effectve – medi lymph pads. 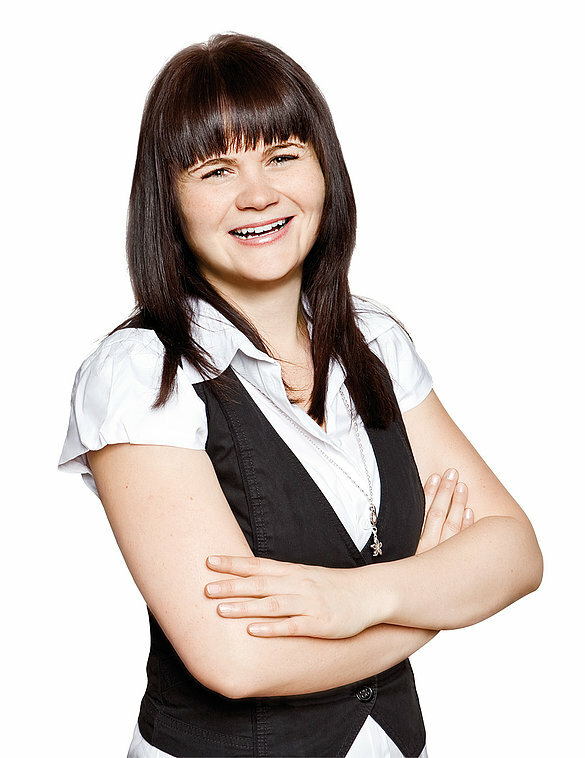 medi is pursuing completely new approaches in the field of treatment concepts.